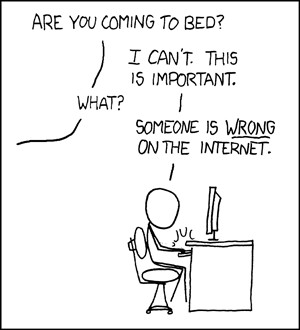 Reacting to articles on the Internet is childish and not a good use of your time. Of course I couldn’t help but ignore my own advice when I read an article on the Huffington Post UK site indicating that Google Analytics is dead. Dumbest Article Ever Written? Probably not, but close! Even though this article was written 5 months ago, it was only recently discovered by the Internet (both Twitter and Google+ communities pointed it out). Since then I have seen the number of tweets rise and comments have been rolling in on the Huffington post website. I am not going to link to this post, because I really don’t want to reward this type of journalism. You can Google the title if you want to give it a read. With this new definition, the sentiment begins to make a lot more sense. This author does not understand the difference between Google Analytics and keywords, which befuddles me to no end. These are two very different things. Perhaps she only uses this section of Google Analytics and feels they are synonymous. If that is truly the case, then I believe that she is correct. Marketers and SEO’s will have to adjust their strategy and look at other metrics in order to replace the insights they previously gained from keyword data. Keyword data as we know it is on its way out. I realize now that it was probably immature to comment on this article, but I just had to say something, to defend the honor of my favorite website on the Internet. To defend my choice in naming my website with ‘alytics at the end. If Google Analytics were going away, what would happen to the thousands of companies (from Fortune 500 companies to top names on the web) that pay Google for the product? What about the fact that Google Analytics is installed on over 75% of all of the worlds websites (including the Huffington Post)? How about the fact that they have launched 70 new features this year? Are those signs that Google Analytics is dying? Have you ever even accessed the Internet before or did you write this post from your Blackberry? This is one of the most pointless, ill researched and misinformed articles I have ever read. I award you no points and may god have mercy on your soul. I don’t often leave negative comments, but whenever it’s necessary I use my full name. No anonymous comments from me. Sure enough when I looked at the article again today I see that they have now issued a correction at the top of the post. Notice the correction language stating that they were wrong? Also notice how much more social media activity has happened from the screenshot above. Talk about making lemonade out of a bad situation. Maybe MD Communications is smarter than I give them credit for. They write a controversial article, it gets noticed and gets all kinds of traffic. Then Huffington post asks you to update the post to be less controversial and you use this as a way to turn the entire article into a sales pitch. Keep in mind that this article now has over 200 social shares in the past 2 days. The post even got this digital marketing blog to write a rebuttal post on a Friday afternoon! Brilliant click baiting strategy execution! With the introduction of Google Analytics Premium, which is growing exponentially faster than expectations, Google is investing more and more into Google Analytics each year. They have a tremendous team of engineers, marketers and partners spreading the word about Google Analytics all over the world. They even created an online academy to teach people how to use their product! If Google Analytics were to go away it would leave a void in the Internet and in my heart. I’m too young and Google is too smart for that to happen. Rest in peace keyword data, but long live Google Analytics!